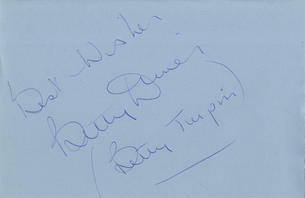 This is a Hand Signed light blue Autograph Album page 6" x 4" by the late Actress and former Singer who has played the part of Barmaid Betty in Coronation Street for many years. Famed for her Hotpots she has signed including her earlier Cast name of Betty Turpin. Elizabeth Mary "Betty" Driver, MBE (20 May 1920 - 15 October 2011) was an English singer, actress and author, best known for her role as Betty Williams on the British soap opera, Coronation Street, appearing in more than 2,800 episodes. She also appeared in its spin-off Pardon the Expression.